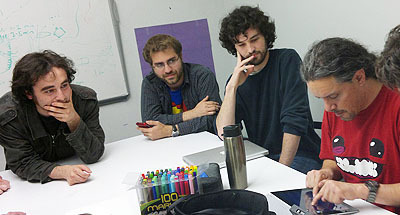 Team Krinoid founders Max Weinberg, Peter Hunter, and John Peters watch as computer science professor Michael Mateas evaluates their iPad game, Syz: EG. Syz: EG is the first multi-touch space shooter game for the iPad. Art by Max Weinberg. A new iPad game called Syz: EG, now available from Apple's App Store, showcases the professional quality of the work done by UC Santa Cruz students in the computer game design program. A galactic adventure game with several innovative features, Syz: EG was created by a team of 10 UCSC students as their senior project for the year-long game design studio course. In June, they won the grand prize in the Baskin School of Engineering's 2011 Sammy Awards for the best student games. Three members of the team then founded Team Krinoid, an independent game development company based in Santa Cruz, which has issued Syz: EG as its first release. John Peters, who was lead programmer for the student team and is now CEO of Team Krinoid, said most of the work since June has involved setting up the company and preparing legal contracts so that all of the team members can earn royalties from sales of the game. "Every once in a while I'd sit down and fix a couple of bugs, and we also added some free play at the end of the game. But other than that, the game is what we created as students," said Peters, who formed the company with team members Peter Hunter and Max Weinberg. Jim Whitehead, professor of computer engineering and one of the teachers of the game design studio course, said he was impressed by how polished the game was for a student project. "It looked like a game you would buy from the Apple store. It booted up in a professional way, the game play was polished and smooth, and the quality of the graphics was high," he said. "On top of that, it had some notable innovations in game design." One innovation is the game's use of the iPad's multi-touch screen to control weapons. Syz: EG belongs to the popular "space shooter" genre pioneered by the iconic arcade game Space Invaders, but unlike other space shooters, the weapons are not limited to shooting in the direction the ship is pointing. 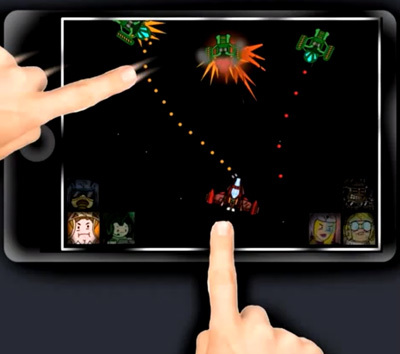 The player can control where the weapons direct their fire using two fingers on the iPad's multi-touch screen. The game also has a story line with multiple characters, following Captain Russel Porter and his intrepid crew as they battle the Fringe Republic. "This first release is the pilot episode of our story," Peters said. "It lasts 40 minutes, like a TV show, and introduces all the characters, and we plan to do episodic releases of new games that will continue the story." Hunter, who graduated in June with a B.A. in literature, wrote the story, including all of the dialogue, and also wrote the music for the game. Weinberg, who earned his B.A. degree in art, did all of the artwork for the game. Seven other students, in addition to Peters, worked on the computer programming: Jonathan Fotland, Lindsey Freeman, Lakota Lefler, Kevin Murphy, Alex Portnoy, Hosh Tachmuradov, and Lucas Thornsberry. During the development of the game, the students received valuable feedback not only from their professors and teaching assistants, but also from professional game developers who visited the class. Veteran game developer Graeme Devine, for example, was able to offer the perspective of a former head of Apple's iPhone Game Technologies division. "He saw our game very early in development and assured us that our control scheme was intuitive and fun to use, even though it had not been seen before," Peters said. "Hearing praise from people in the industry that we looked up to really helped us stay motivated and put in the long hours needed to have a polished and professional game." For now, the Team Krinoid founders are working out of their bedrooms and hoping that sales of Syz: EG will give them enough funding to set up an office in Santa Cruz. Peters is working on a side project with UCSC astronomer Jonathan Fortney to create an iPad app that will simulate the orbits of newly discovered planets using data from NASA's Kepler mission. "You'll be able to view the orbits and bring up information about the new planets. I'm thinking about trying to make it more like a game," Peters said. Christopher "Kip" Radt, a recent graduate of UCSC's film and digital media program, worked with Hunter to create a video documentary about the development of Syz: EG, which can be seen on YouTube. More information about game design programs at UC Santa Cruz is available online from the Center for Games and Playable Media.